It’s been nearly three weeks since the family and I left Breckenridge but I’m still thinking about all the birds that we enjoyed from my aunt and uncle’s backyard deck at 10,500 feet above sea level. 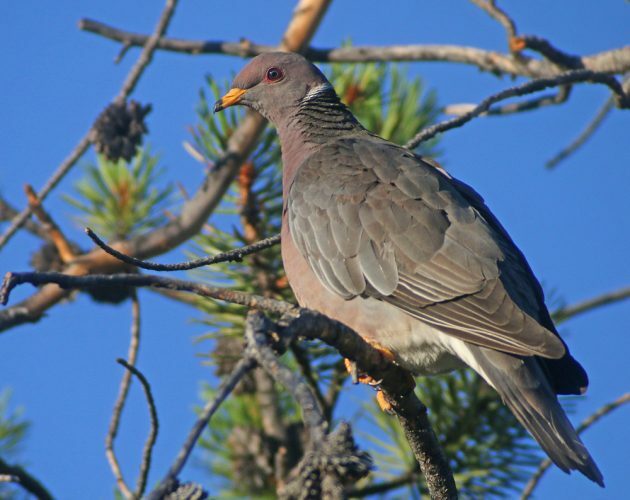 Species that back here in New York either don’t occur or only occur in winter and that necessitate a drive far to the north of New York City were common in the backyard in Breckenridge. Of course, this is one of the great boons of traveling for a birder: you get to see stuff that would otherwise be impossible to see on your home turf. Not only that, it’s easy! 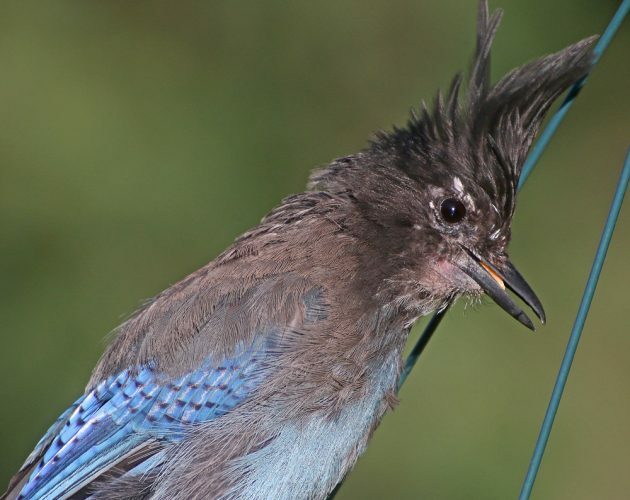 The bold black-and-blue Steller’s Jays had no problem gorging themselves at the feeder. We spent three days in Breckenridge and each morning I was the first in the family to awaken. I’d put coffee on and then slip out the back door onto the deck with my digiscoping rig to see what was coming to the feeder and what was feeding in the yard. I was never disappointed and occasionally pleasantly surprised. 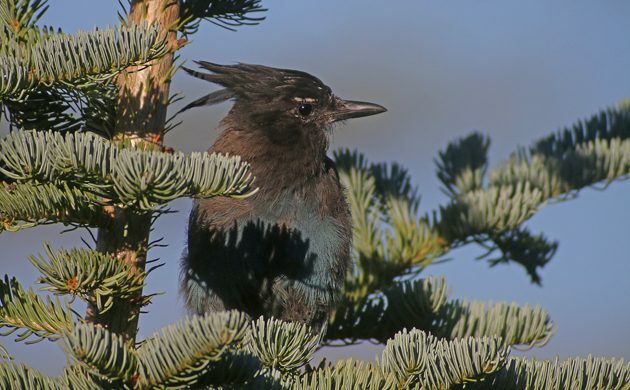 For example, I expected Steller’s Jays. What I didn’t expect were Clark’s Nutcrackers and Gray Jays though why not I’m not sure. The three together, combined with Common Ravens and the occasional American Crow, made for a nice quintet of corvids. I don’t think I’ve ever had five corvids in a single day, much less from a single spot with my coffee handy. Clark’s Nutcracker against Breckenridge’s blue, blue sky. And the finches! The finches! 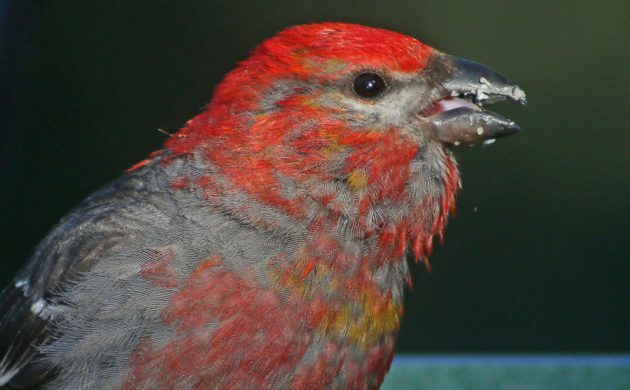 Pine Grosbeak is a real treat for New Yorkers and many a city-birder has made the journey to the Adirondacks to see these large, almost parrot-like birds. All I had to do in Breckenridge is go outside and listen! There were also Pine Siskins everywhere though our lack of a thistle feeder meant none came in to eat. 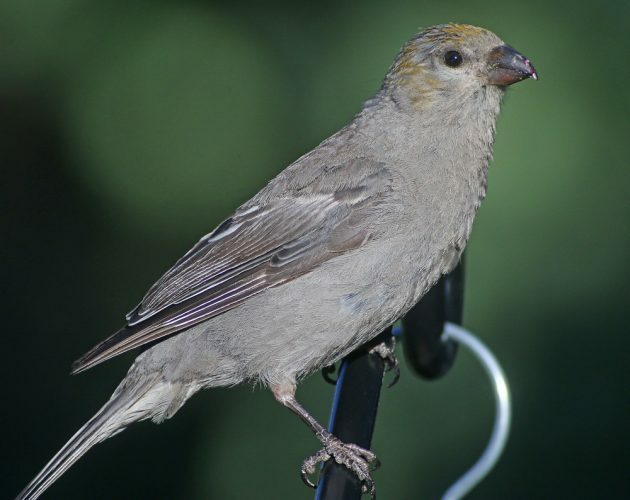 Cassin’s Finches made me much more familiar with them as they are a bird I have seldom seen. And Red Crossbills made a flyover once though I never managed to find any cracking open cones. The male Pine Grosbeak is, of course, gorgeous, but the subtle shading of a young bird, below, is pretty nice too! Of course, other birds besides finches came down to the tray feeder. It’s always nice to see Mountain Chickadees but the Pygmy Nuthatches really stole the show as far as I am concerned. 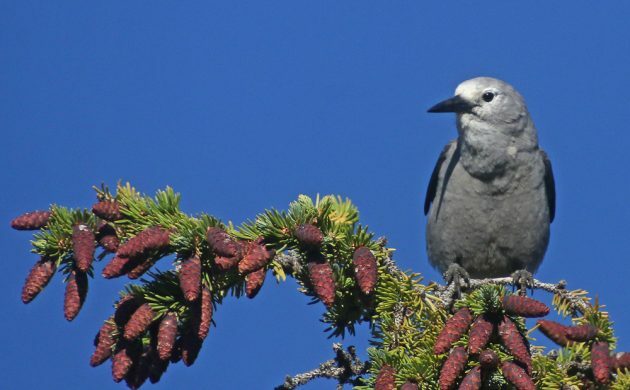 Both species made regular visits to grab sunflower seeds as well as the Great Basin form of White-breasted Nuthatch which will be its own species at some point. 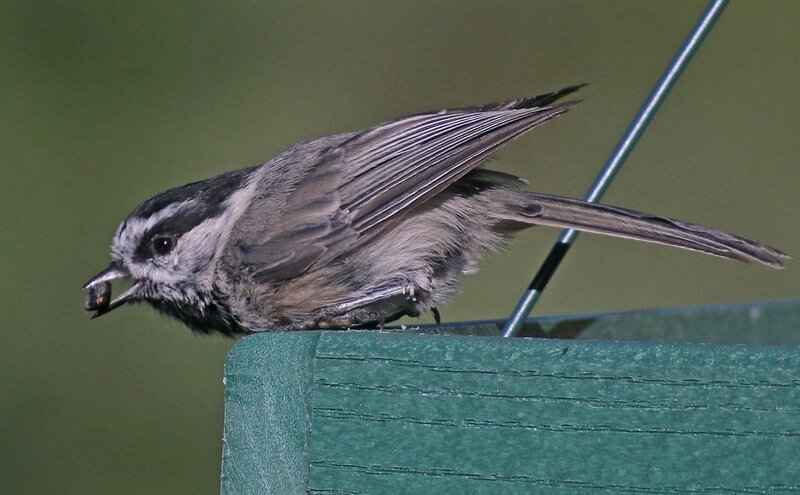 Mountain Chickadee heading off with a sunflower seed. 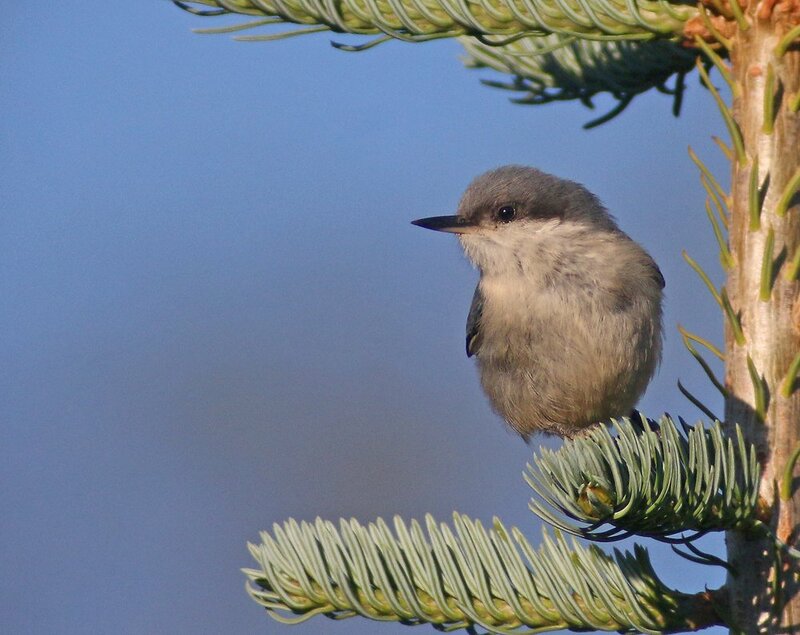 Adorable is one of the few words that really works for the tiny Pygmy Nuthatch. And, of course, lots of birds were present in the yard that did not come to the feeders. But before we get to that there was a creature that really wanted a feeder of its own and seemed used to getting fed by humans. Well, actually, there were two. Two Red Foxes would regularly come up on the deck to see if any scraps were to be had. Gorgeous animals, and amazingly graceful, but a bit worrying when they are sitting a foot or two from your six-year-old who was sorely tempted to give them a snack. They are, after all, predators, and while I wasn’t worried about one attacking Desi I was concerned that he would feed them and perhaps get accidentally bitten. 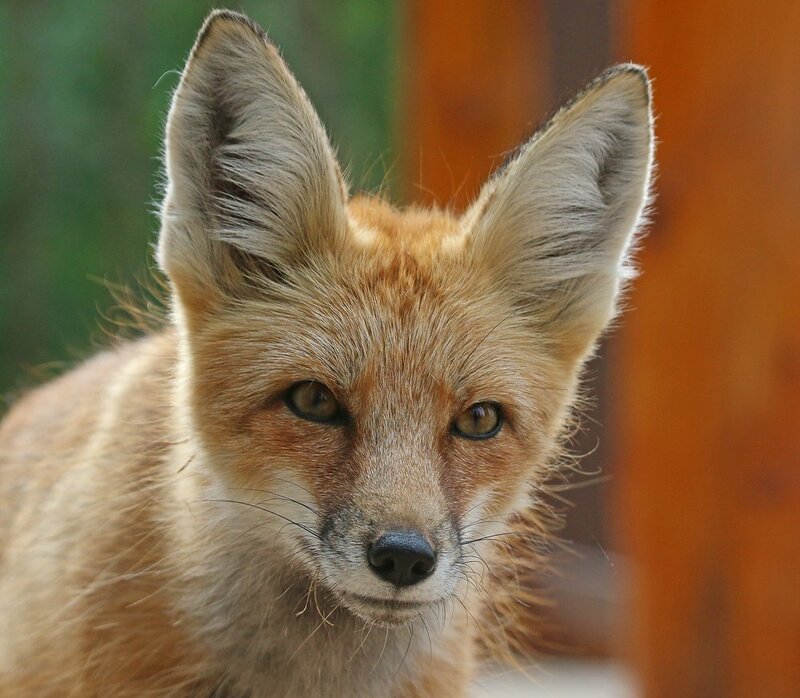 My worries were unfounded but I must say it is an interesting experience to have foxes begging by the table. Right, back to the birds. Say pigeons and we New Yorkers automatically think of the ragged sky rats that tourists love to feed. But in Breckenridge we had much nicer pigeons to watch, Band-tailed Pigeons! Though I saw them repeatedly throughout our stay this was the only time one sat on an exposed branch in good light at close range. 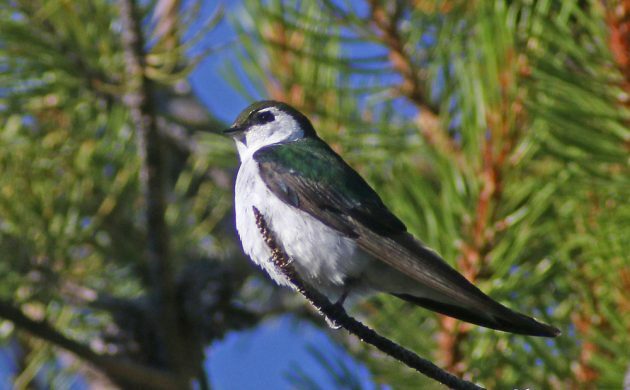 The most common bird in or, rather, above the yard, were Violet-green Swallows. There were dozens and as much as I tried I did not manage a single decent flight shot. Instead I settled for a perched bird. I’d like to see one of these in New York some day. Flycatchers weren’t terribly common though I did get my life Cordilleron Flycatcher and a Hammond’s Flycatcher. I saw Western Wood-Pewees a couple of times and managed a few shots of one of them. 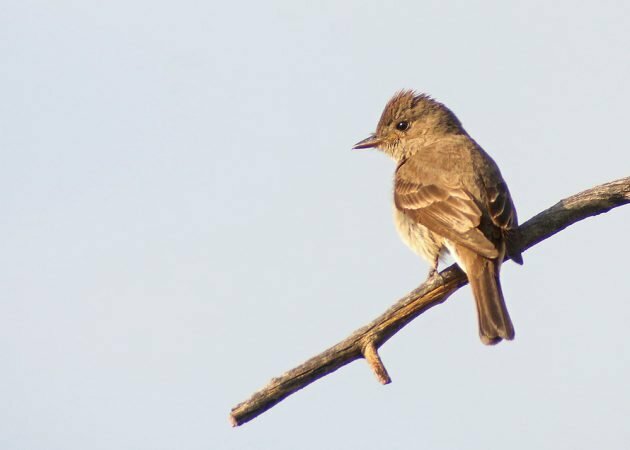 Western Wood-Pewee is a pretty boring bird. I did enjoy getting shots of some of the birds that would visit the feeders when they weren’t visiting the feeders. 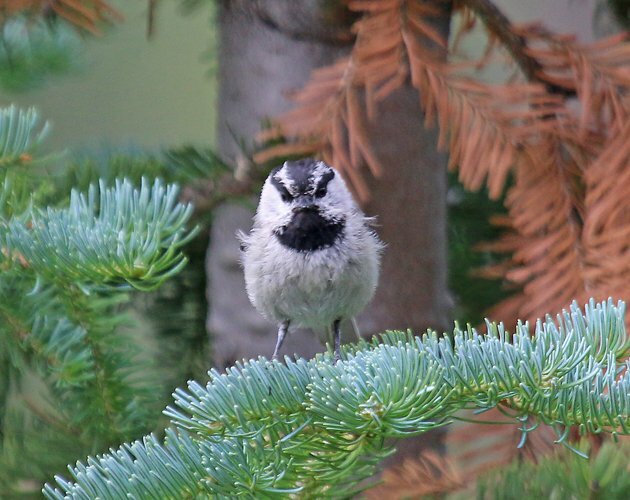 Mountain Chickadees are the prototypical angry bird. 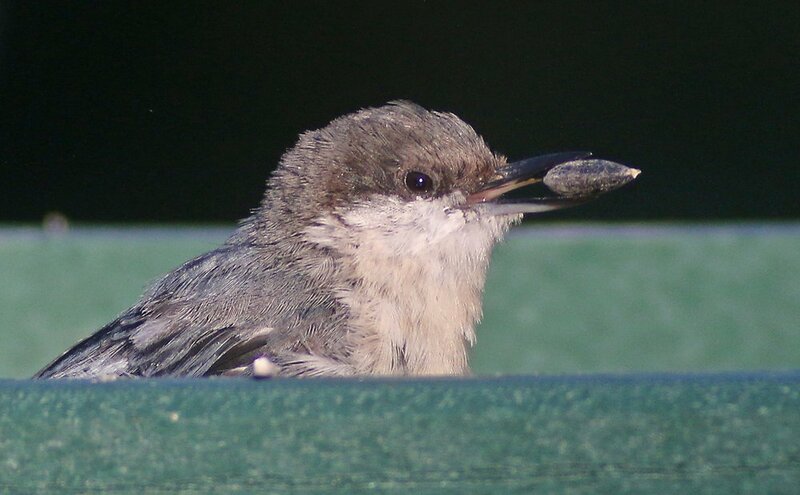 I couldn’t get enough of Pygmy Nuthatches! Someday I will go back to Breckenridge and enjoy all of these birds again. Until then I will have to, like you, enjoy these images. 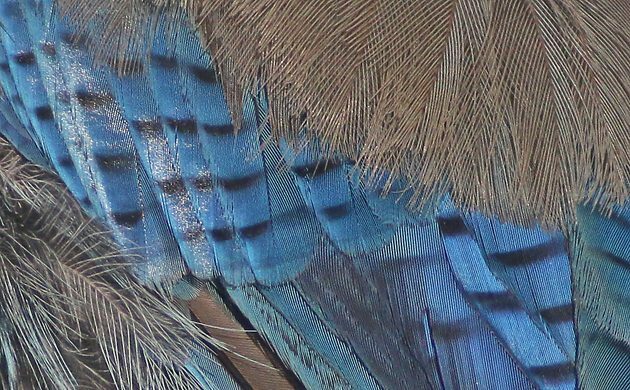 Steller’s Jays have very nice feathers. Great images Corey! I lived in Aspen for a year, and really enjoyed that same group of birds! Gotta love road trips! !